L.I.S.A are extremely humbled and proud to have been nominated for the FSF Fans for Diversity Award for 2018. This is the second year running that we have received a nomination and once again we look forward to attending the awards ceremony with five other fantastic groups from across the country. Our fellow nominees are AccessiBlues (Birmingham City), Apna Albion (West Brom), Proud Baggies (West Brom), Proud Lillywhites (Spurs) and Proud Valiants (Charlton). As can be seen L.I.S.A are the only representatives in the category from League 2 as we join supporter groups representing clubs from London and the West Midlands. L.I.S.A has enjoyed a busy 2018 with diversity work, fan engagement, charity fundraising, academic liaison and in developing relationships with other supporter groups. 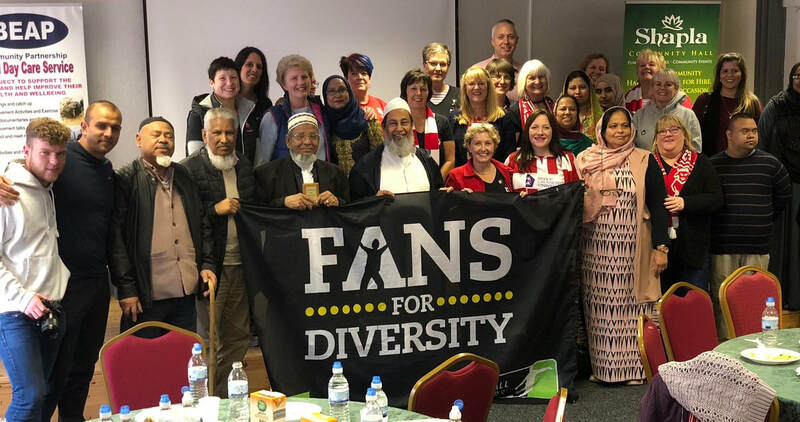 We continue to work not only in encouraging diversity in support but also look to take the next step in brining fans from different backgrounds together. The FSF awards ceremony will be held at the Tower of London on Monday 3rd December. We are presently half way through our fantastic FSF funded exchange project with the Bradford City Supporters Group the Bangla Bantams. Following a brilliant day in Bradford last month we are privileged to be hosting the Bangla Bantams here in Lincolnshire on Wednesday 14th November. 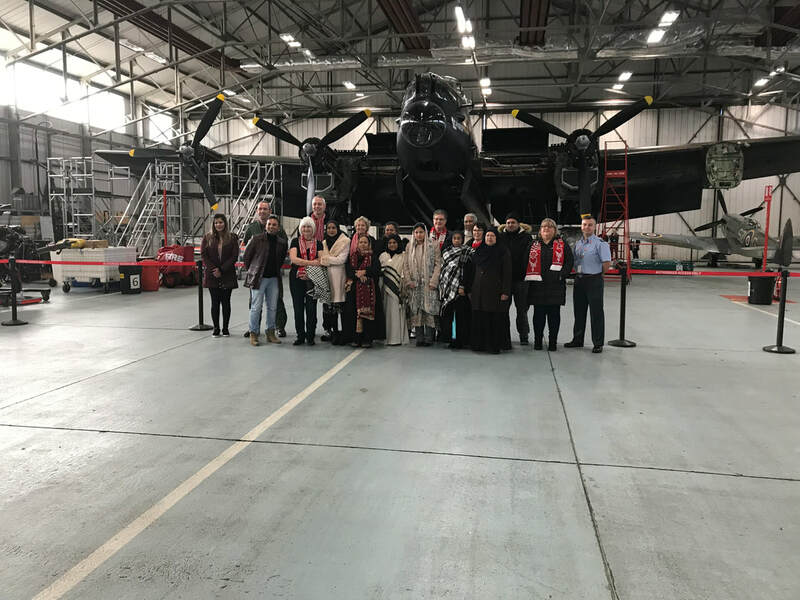 We will be enjoying a lunch and stadium tour together at Sincil Bank as well as visiting Lincolnshire icons the Red Arrows and Battle of Britain Memorial Flight. The project is designed to bring supporters together from different backgrounds to promote diversity in support and community cohesion. Particular thanks go to Dean Wagstaff of the RAF, Lincoln City Football Club, Humayun Islam of the Bangla Bantams and Anwar Uddin of the FSF for supporting the project and enabling it to happen. A short film is being produced of the project to highlight the great work of the FSF Fans for Diversity campaign in conjunction with Kick it Out. We will continue to work hard and celebrate the fact that the beautiful game really does have the power and ability to bring communities and people together. ​Well I'll be damned... Chelsea are coming to Sincil Bank. The 'development' squad of my other club are coming here. I guess I'm one of those two team (insert crude word) ... and I should be of mixed emotions right? Wrong. I'm fully backing Lincoln. I'm not afraid to say that and whilst I'm neither for nor against the boycott (of which none of us can speak about without weeks of debate) I would love to elaborate on my thoughts on why everyone up and down the country with a love for the game should be rooting for the Imps and it's really not boycott related. Early on in the week Chelsea's senior team took on Arsenal in the League Cup losing 2-1. During the game Willian was injured and Conte only had Ross Barkley to bring to the field of play from a drab bench. He was a controversial signing, having saved 20mil in the January sales, bagging him for a sweet 15mil. So here he is centre of attention being shoved on to the pitch alongside some of the best players the Premier League has to offer. On he goes and whilst I wholeheartedly agree he is lacking in performance he needs time on the ball, game time! With that and guidance I think he may well be a fantastic player. Now maybe it's the grassroots in me or maybe it's that I'm a human being but I, a 31 year Chelsea supporter, almost broke my TV listening to Conte slam him after the game. He spoke like he was dealt a really bad hand having to play him. Like he had just been told Pete from division six Sunday side Red Lion was coming in as his new midfielder. Now I have a real problem with the interview for one reason. Player development and duty of care. Imagine what that has done to Barkley! Imagine what his mind set is in the days after? So what does this have to do with Checkatrade? Well for starters we have a manager to be proud of. And if Conte at the top thinks that this is acceptable ,what happens lower down? I tweeted earlier this week about my disgust for Conte and admiration for Cowley. Would you ever hear Danny talk that way? No ... No way would the King of Sincil Bank allow that dark and detrimental mind set to creep it's way in. Danny and Nicky have their priorities straight and that priority of a good mind set is what makes Lincoln City FC great contenders to reach Wembley. It's what wins us games. First to say, we wish everyone a very happy new year and here’s hoping for another year as successful as the last for Lincoln City FC! It has been a busy start to 2018 as we put plans in place for various projects. We have just launched tickets for our latest L.I.S.A Spring Night event on Friday 16th March which is a sponsored event. Late last year we were contacted by Bluebird Care who much to our delight and gratitude offered us help with sponsorship of a future event. We are immensely grateful that Bluebird Care have been so supportive of L.I.S.A and we are able to pass this goodwill and offer of support directly to fellow Imps for the forthcoming get together. We expect ticket demand to be high (they are already selling) so please don’t miss out. This is a L.I.S.A event open to all, indeed we would like to invite new people to attend so please ask friends and family and spread the word, there will be a good mix of ladies and gents. We are thankful for being hosted by Ruston Sports and Social, the venue provides a dance floor for the more energetic amongst you! Punch the Monkey are a really popular Lincoln band so it promises to be a brilliant night on Grimsby Town Eve! The normal Lincoln City related theme will be apparent. Tickets including a fish and chip basket meal are priced at just £6 (yes, that’s right, 6 quid!) for members and only £10 for those that aren’t. You are able to become a L.I.S.A member before the event to take advantage of the lower price and benefit from discount at future events if you wish - tickets are available on the events page, link below. The club are being proactive in encouraging support and togetherness from all fans old and new. L.I.S.A will do all it can to support both this ideal and fellow supporters / fan groups for the common good of the club with joint projects already in discussion for the future.